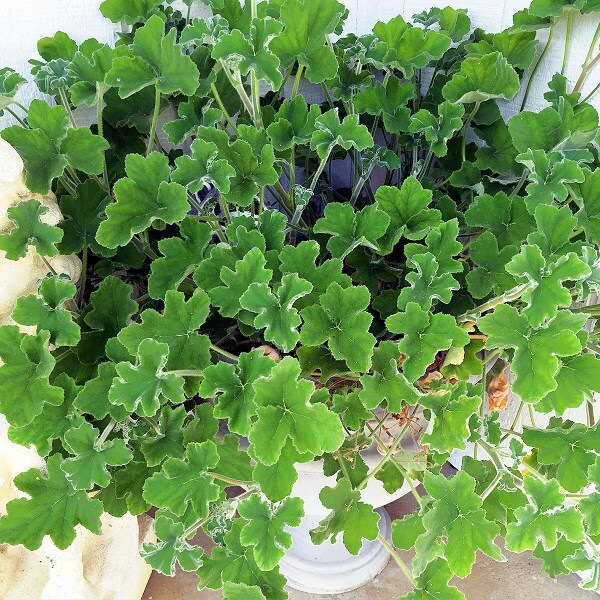 The Peppermint Scented Geranium above is in a three gallon pot. It was started with one our three-inch pots in spring and then brought in the green house to go through the winter. Plants in pots can be more susceptible to dying from winter cold than plants in the ground. Mid-way through its second spring, it became root bound and was then planted in a permanent spot in the garden. Peppermint Scented Geranium is truly a marvel. Wonderfully felted, large irregularly shaped leaves emit an aroma that will have you looking for a true mint plant. New leaves tend to be crinkly and extra gray but unfurl with age and become flat and darker green. The under sides remain gray and the stems take on a grayer appearance than the leaves which makes for an attractive complement of colors on the one plant. 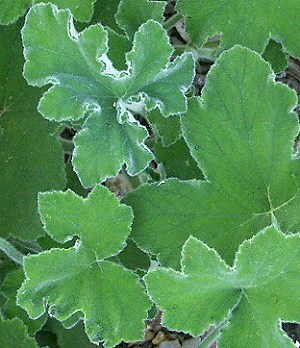 Peppermint Scented Geranium sprawls and creates an effective cover for the ground. Since the plant is rather low to the ground it works best in the front of the garden, and would be ideal for hanging over a wall or growing up a tree or rock. 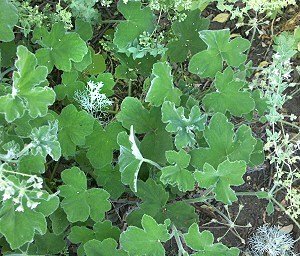 In the lower left corner of the picture to the left, you can see the small sprays of white flowers that this scented geranium randomly exhibits. The little white flowers can be used as a fragrant garnish. This close up of one of the Peppermint Scented Geranium's flower sprays shows how this geranium got its specie name tomentosum, which is Latin for densely woolly with matted hairs. This covering of "wool" helps to shade the plant and keep it cool. Since scented geraniums are native to Africa, this is a handy survival mechanism. While Peppermint Scented Geranium can be used in recipes calling for Scented Geraniums, it is really more of a fragrant garden plant than a culinary herb. 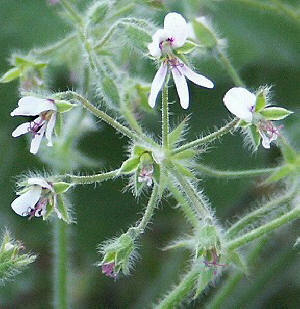 Peppermint Scented Geranium makes a great addition to our Zone 8-11 Fragrant Herb Garden Six Pack.